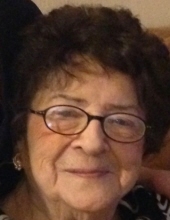 Age 93, of Castle Shannon, passed away surrounded by her loving family on January 30, 2019. She is survived by her beloved daughters, Christine (Randy) Richards and Linda Donauer; grandchildren, Amy (Christoper Weigold) Russman, Tracy (Nick) Posa, and Lisa (Fernando) Palombo; great-grandchildren, Jacob Lowden, Tanner Orr, Giovanni Palombo, Jared Russman, Riley Orr, Alessia Palombo, Jase Weigold, Morgan and Julia Pokora, and great-granddaughter and best friend, Kaylee Russman who she loved more and more; as well as many nieces, nephews, and friends. She was preceded in death by her husband, Joseph F. Donauer; parents, George Sr. and Mary Joseph; and brother, George Joseph, Jr. Visitation will be held on Friday, February 1, from 2 to 9 PM at the JEFFERSON MEMORIAL FUNERAL HOME, INC., 301 Curry Hollow Rd., Pleasant Hills, 15236. A Blessing Service will be held Saturday, February 2, 12 PM, in the funeral home chapel. Condolences may be left at www.jeffersonmemorial.biz. To send flowers or a remembrance gift to the family of Dorothy L. Donauer, please visit our Tribute Store. "Email Address" would like to share the life celebration of Dorothy L. Donauer. Click on the "link" to go to share a favorite memory or leave a condolence message for the family.